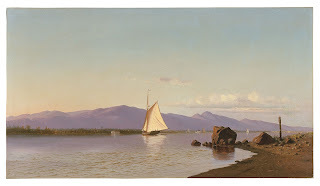 Painting by Francis A. Silva (1835-1886). Virtually all of Silva's paintings are focused on water; scenes of calm rivers greatly outnumber the seascapes, and few of those have any measure of wave action. He often painted boats with their sails full of wind, and seemingly full of promise. The ideal situation on the water appears to be a different world from the gritty bank where the observer stands, and to which the painter devoted a great deal of attention.